66 other birds have this item in their bag or wishlist! Big bold stripes characterise the Hammamas Bold Towel. The tasseled fringe is hand finished in an age old Turkish tradition by women in rural Turkey. 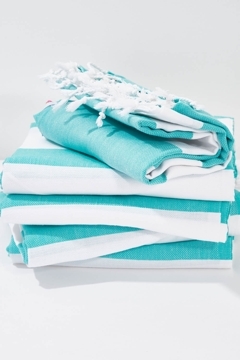 These towels are really lovely and make beautiful presents. Great quality and bright colours. Just back from our Xmas break where I put this to the test when showering at our various campsites. Very pleased with its absorbency and handy to be so featherweight. It dries really quickly and folds away neatly. Gave these out as Christmas presents and had one recipient come back to ask if there were any more.